If you're searching for the freshest fruits and vegetables to add to your diet, you don't have to look any further than your own backyard! With dozens of detailed illustrations, color photos, and more than 150 tasty recipes, this guide is your ultimate one-stop reference for identifying and harvesting the wild fruits and vegetables that grow in fields, forests, and even on your own lawn. 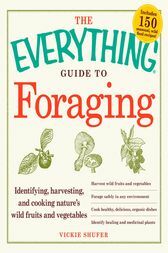 From clover and cattails to milkweed and mustard, this book will teach you how to collect and prepare some of the most common--and delicious--feral plants in America. And, more than just a way to a fantastic meal, this book will guide you to both a newfound confidence in your own abilities, as well as a greater appreciation of the natural world.